Confusingly, this Game Boy title is actually a reworking of Adventure Island II which was originally released on the NES in 1991. In this side-scrolling platform game you play the role of Master Higgins who must travel through eight islands, defeat the Evil Witch Doctor and rescue your sweetheart Tina. To help you in your quest you can pick up items such as hammers that kill enemies in one hit and skateboards that race you along through the levels. Your health meter constantly diminishes so you must ensure that you collect fruit scattered around the levels to top it up. The controls are a bit slippery due to the momentum your character has after jumping - this results in a few unnecessary deaths as once you hit the ground you'll start sliding and subsequent button presses are sometimes ignored. If you manage to collect a hidden playing card suit Higgins will be aided by one of four types of dinosaur that have unique abilities such as fire attacks and tail whips - this drastically improves the control mechanics but does make the game a bit too easy. I would have liked to have seen more distinctive level design as each world tends to look the same and they end up blurring together. Even the bosses are a letdown as they're repeated throughout the whole game with only minor tweaks. There are some nicely detailed graphics with large sprites, smooth scrolling and no signs of slowdown. The music is pleasant and makes great use of the Game Boy's stereo output although there aren't any real memorable tunes. The SFX are excellent and I love the arcade style sounds when you collect fruit or hit an enemy with your hammer. Don't get me wrong, Adventure Island isn't a bad game. If you can look past its shortcomings you'll find a solid platformer that's fun to play through. I did enjoy my time with it but just found it to be overly repetitive as it sticks to the same gameplay elements found early in the game and refuses to throw any other surprises your way. Random trivia: The Adventure Island series is actually a reworking of the Wonder Boy franchise which began life in the arcades in 1986. 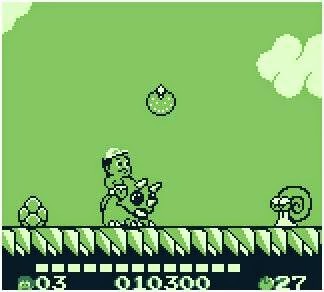 The latter eventually moved towards the action RPG genre while Adventure Island predominantly stuck to its original roots.